Poor literacy is terrible for your health, both physical and mental. We tend to assume that most adults can read and spell well enough to cope with all the literacy demands of a complex, modern society. However, the Australian Bureau of Statistics’ Programme for the International Assessment of Adult Competencies shows that nearly half the population actually can’t. Level 1: read brief texts on familiar topics to locate a single piece of specific information. Level 2: make matches between a text and other information, perhaps paraphrasing or making simple inferences. Level 3: identify, interpret, or evaluate information. Level 4: perform multiple-step operations to integrate, interpret, or synthesise information. Level 5: search for and integrate information across multiple, dense texts, interpret, synthesise and contrast, evaluate evidence-based arguments. 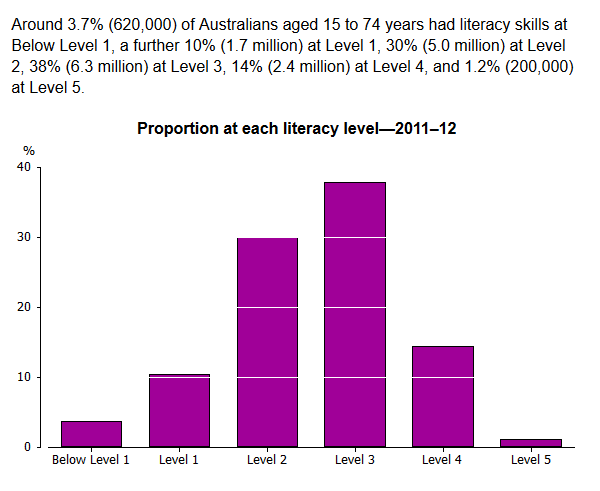 I find it pretty shocking that this received very little publicity, and that our governments and institutions continue to behave as though most adults are at Level 4 or 5, when this is the third large-scale ABS survey to show millions of adults are really struggling with literacy. This is a serious problem for health professionals. We often communicate with patients/clients in writing, yet the ABS is telling us that 60% of the adult population is below the “coping” line on health literacy. Adults need to be able to read and spell, understand written health information and take charge of their own health, and the health of their kids, to thrive in our complex modern society. So the fact that our education system is not ensuring most adults can do this should seriously concern all health professionals. Is literacy being taught as well as it could be? The 2005 National Inquiry into the Teaching of Literacy’s first two recommendations were that teachers need more training to ensure they teach in an evidence-based way, and that they should be teaching early literacy via systematic, explicit phonics, which teaches how sounds and their spellings are connected, and how to sound out words. Sadly, these less-effective teaching methods like rote-memorising word lists and encouraging students to guess words from pictures are still widely used. As in health, an ounce of prevention can save a ton of cure, and given the dire health implications of low literacy, this is something health professionals should be concerned about, and discussing with anyone they know with influence in the education sector. Health professionals are typically taught to understand the evidence pyramid and seek to use approaches based on high-quality, randomised controlled design research, and to raise an eyebrow at interventions justified by testimonials and other anecdote. Unfortunately, teachers are not taught much about research design and statistics, so like the rest of the population, many find it harder to tell the difference between well-conducted research and research with methodological concerns, and thus dubious conclusions, and are often persuaded by anecdote. There is also sometimes a tendency to prioritise innovation over evidence in education. The gap between good research and practice in education is thus quite wide, particularly in literacy teaching, as this ACER literature review outlines. Some people regarded as authorities in literacy education use anecdotes rather than evidence as the bases for many of their arguments – click here for one example, which also quotes the Cmabrigde Reading Hoax (an internet meme that begins “Aoccdrnig to rscheearch at an Elingsh uinervtisy…) as though it is factual. In his 2017 book Language at the Speed of Science, US psychology professor Mark Seidenberg explains why everything this meme says is untrue. Please don’t assume that just because someone is an adult, they can read your written health information. Check that they can tell you the most important things you’ve told them before they leave. Keep handouts and other written information for clients as simple as possible without compromising accuracy, to make them accessible to as many of your clients as possible. As well as more evidence-based literacy teaching in our schools, we need evidence-based catch-up programs for those who didn’t learn to read and spell when they were children. If you find someone of any age whose reading or spelling isn’t not as good as it should be for no obvious reason, please encourage them to get an assessment, which should cover at least phonemic awareness and word and pseudoword reading, spelling, working memory and rapid automatised naming. This type of assessment can be done by a speech pathologist, psychologist or teacher with the relevant specialist skills. A speech pathologist can also assess speaking and listening skills if these also seem to be problematic, as many people with language disorder struggle to learn to read and spell. There’s a good chance that adults who can’t read or spell much were not able to independently crack the complex spelling code of English by themselves, and that the school(s) they attended didn’t teach it explicitly. If that’s the case, with good intervention they can probably still significantly improve their reading and spelling skills, but unfortunately, mainstream Adult Literacy programs are often language-immersion type programs, not explicit, structured phonics programs that build skills. If decoding/spelling is the key area of deficit, a tutor is likely to have more success, or even a family member or friend using an inexpensive program like Toe By Toe.